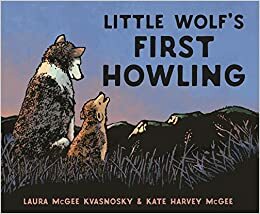 Summary: It’s a big night for Little Wolf–his first howling. He and his father, Big Wolf, travel to just the right spot under the stars and a full moon. Big Wolf demonstrates, “Aaaaaoooooooo!”. Then Little Wolf tries. “Aaaaaooooooooo! I’m hoooowling, ‘oooowlng, ooooowling!” Hmm, not quite. Big Wolf tries again. And again. But each time Little Wolf adds more and more, skiddily skoddily beep bop and some diddily daddily dooooooo. Big Wolf tells him it’s not proper howling form, and Little Wolf tries one last time. This time, Big Wolf can’t help himself. His paws start tapping, and before long he joins in, do-wopping just like his son. “Wait until we tell the others!” exclaims Little Wolf as they head for home. “Oh, I expect they already know,” says his father. 32 pages; ages 3-7. Pros: The pictures are gorgeous, perfectly capturing the moonlit night and the two beautiful wolves. The message about self-expression is just right for kids. And the right reader could have a lot of fun reading those howls. Cons: I suspect I’m not the right reader.